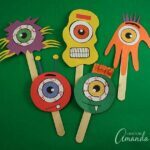 Use craft sticks and construction paper to make an endless assortment of silly popsicle stick monsters! Draw simple shapes for the monster bodies. You can use a wide mouthed cup to trace out circles, or cut out blob-type shapes, whatever you like! Cut hair, claws and antennas from construction paper. I even used a handprint to make one of the monster bodies. When I printed these eyeballs off they were a little smaller than I wanted, so I simply enlarged them on my copier. You can draw simple mouths by cutting out a shape from white paper then drawing lines for the teeth. Assemble your monsters using glue. Attach each one to a jumbo craft stick. let them dry completely and have yourself a fun puppet show with your friends! This project for Popsicle Stick Monsters was printed from CraftsbyAmanda.com - https://craftsbyamanda.com/popsicle-stick-monsters/ and can only be printed for education or personal use.